Fig. 22. Norfolk & Western train schedule. 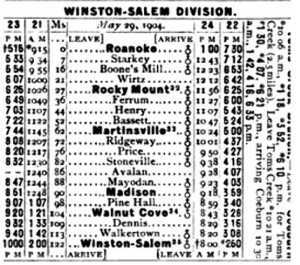 Winson-Salem division, May 29, 1904. Avalon is listed on the route but is misspelled as "Avalan"
Fig. 23. 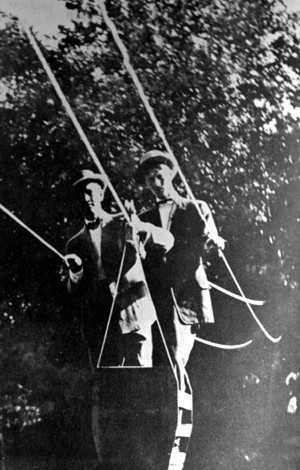 Frank Matthews(left) and George Meadows Suttenfield on the swinging bridge. While the efforts these mill workers took to ensure safe passage over the river were both imaginative and commendable, one can't help but wonder why the company didn't afford a proper bridge for its' employees. 1. Foushee, Ola Maie, Avalon: A North Carolina Town of Joy and Tragedy (Chapel Hill, NC: Books, 1977), 8. Fig 22 - Unknown, Norfolk & Western Train Schedule (unknown), Train Schedule [from The Official Guide of the Railways and Steam Navigation Lines of the United States Porto Rico Canada Mexico And Cuba (New York: National Railway Publication Company, 1904), 879]. Fig 23 - Unknown, Rope Bridge (1900-1911), Location, Avalon, NC, Image [from Avalon: A North Carolina Town of Joy and Tragedy (Chapel Hill, NC: Books, 1977), 60].